In the future, clean, renewable energy won’t just be generated on rooftops and open fields. Several innovative organizations are coming up with unique ways to integrate renewables into our daily environments. For example, Onyx Solar has developed solar windows that can convert natural sunlight into electricity. They also keep out harmful ultraviolet and infrared radiation. And engineers at Solar Roadways are currently developing a system of solar panels that are safe to walk and drive on. They not only generate electricity, but also help keep roads ice and snow free during the winter months. Charging your digital device – like your iPad or smartphone – without plugging it in is becoming more and more common these days, with companies like Dell, Samsung and Mophie offering forms of the technology. But did you know this technology is being explored for possible use in the world of energy? For example, WiTricity is developing the technology for use at charging centers for electric vehicles (EVs). With WiTricity’s technology (which was developed by physicists at MIT), EV drivers can pull into a spot in a parking garage and receive power without plugging in. Along the same lines of this technology, engineers are also working on equipment embedded into the roads that allow electric vehicles to charge while they’re being driven. Waiting for your energy bill to come in the mail can be stressful, especially when you don’t know how much energy you’ve used this month. With new mobile apps, there is a simple solution. These smartphone applications let consumers track and pay for the energy they use, often in real time. In addition to paying bills through the app, users can also personalize budgets and set up alerts to notify them if their usage is higher than normal and what might be the cause of the unusually high usage. In some communities, consumers are now experimenting with the option to buy and sell electricity to and from neighbors in their community. For example, if your neighbor has solar panels on their roof and they generate more electricity than they need, you can purchase energy from them instead of from your local electric utility. 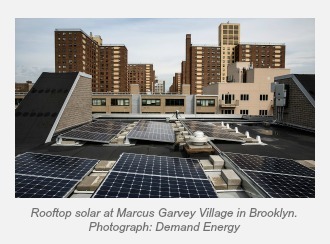 The Brooklyn Microgrid, a test project to buy and sell energy credits among neighbors, is currently underway in Brooklyn, New York. This makes for a more resilient and renewable energy model – and can often be much cheaper as well. With automation, we now have the power to control almost everything from our smartphones – from home security systems to entertainment like music and movies. And this technology is making controlling your home energy use much easier and sometimes cheaper. For example, smart thermostats, such as those from Nest and ecobee, help manage your energy use by allowing you to control your thermostat from any connected device. This means you can turn your air conditioning unit down on the way home from work or when you are on the way home from vacation so your house is cooled down for your arrival. If used correctly, these devices can enable customers save up to 15 percent on their heating and cooling bills and on average will save around $140 a year after the switch. City planners and municipal leaders are using smart technology to improve the lives of the 80 percent of Americans that reside in urban areas. They are installing sensors on street lights, buildings and road signs to track energy use. Along with this, cities are also monitoring traffic congestion through these sensors. This will help cities to alleviate problems such as traffic and spot equipment failures before they occur. The City of San Diego, for example, is currently working with General Electric to install sensors on 3,200 street lights to monitor the operation of the lights, traffic flow and control crime by pinpointing gunshots. That’s just a handful of the changes that are making the world of energy smarter, cleaner and often cheaper too. To learn more about what’s coming next in the world of energy and how these innovations might benefit you, check out our series of fact sheets here.